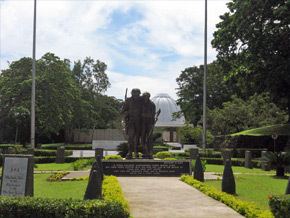 Corregidor is one of the most visited tourist attractions in the Philippines. What was once a place where you’d hear deafening sounds of gunfire, is now a peaceful and quiet place. The only sounds you’ll hear now are of nature. The Sun Cruises Tour to Corregidor leaves early in the morning, from a pier on Roxas Boulevard, Manila. It’s about an hour ferry ride to the island. The tour included, a round-trip ticket, a guided trolley tour of the island (about four hours), and a lunch at the Corregidor Hotel. The Corregidor Island Tour includes the Lorcha Dock, where General MacArthur left to go to Australia where he said this famous words “I Shall Return” and the Malinta Tunnel, which was used as a hospital for wounded soldiers and as the headquarters for US officials. The next stop is the Pacific War Memorial Museum, a dedication to the fallen American-Filipino soldiers. The memorial is excellent. This is only one of two war memorials built by the US government. The other one is at Pearl Harbor, in Hawaii. There are other memorials on the island including, the Japanese Memorial, where Japanese tourists pray for their dead, General Wainwright, American nurses, General MacArthur and the Filipino heroes. The barracks used by the Allied forces is 1,520 feet long. You’re not allowed to go inside, because of falling debris. You’re allowed to take pictures in front of it. Next, you’ll stop at the big guns that were placed in different areas of the island. You’ll spend more of the tour time here. You don’t have to be a military person to appreciate those canyons. 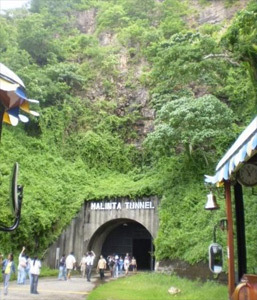 The highlight of the tour is the 30-minute light and sound show at the Malinta Tunnel (pictured left). It was about the fall of Corregidor. It is so intense, that you’ll see some teary eyes around you. You’ll wonder, what was it like for those people who actually experienced it. They must have been very scared. The tour is very educational and fun. At times, you’ll get emotional, but that’s okay. And by the way, the tour guide is very helpful—quite knowledgeable of the islands history. Aside from the ruins of the war, you’ll appreciate the lush landscaping and natural surroundings that Corregidor has to offer. Picture source: Main picture (top) was taken by SunKing. Im rose a tour operator in Olongapo City, i was hoping if you could help me in giving my group a cheapest rate through you. Please contact me at my email as soonest posible time. Looking forward in doing business with you.